In our previous post we talked about superfoods for dogs, to continue the trend we created a recipe using a few top ingredients. Kale- Now known as a Super Food for Dogs, it has been proven to help at least 5 types of cancers in humans and research has shown it provides the same benefits to dogs. It lowers cholesterol, is full of nutrients, is an anti inflammatory and an antioxidant. Quinoa- Is thought of being one of the most complete foods in nature. It contains protein, magnesium, fiber, manganese, and copper. Quinoa is NOT a grain so it is easily digestible and good for dogs with food allergies and digestive problems. Carrots- They are high in fiber, contain beta carotene and vitamin A. A great low-fat snack that is good in raw form too. First, in a medium size pot warm up the olive oil on low heat and add carrots (cover pot). Cook for 20 minutes stirring from time to time. Add chicken breast slices at the 15 minute point to get the flavors cooking together. In a small pot cook the quinoa in 2 cups water (cover pot) for 20 minutes on low heat. Second, pour the carrot mix into a bowl and use the same pot (it has olive oil residue and flavors) to cook the kale in with 8 cups of water (cover pot). Another option is to cook the kale in some chicken or vegetable stock (low sodium) to get more flavors incorporated for pickier dogs. Cook kale for about 20 minutes, until soft. 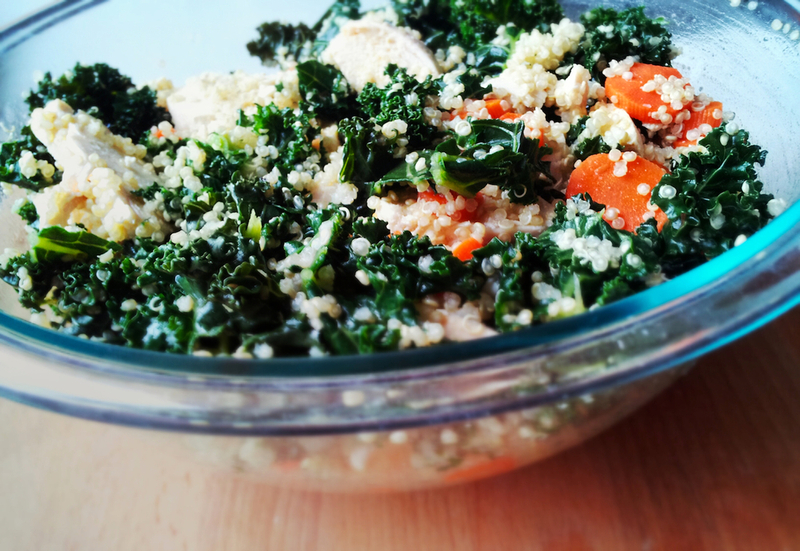 Finally, drain the kale and mix everything together in a large bowl that can be sealed the fridge. It will last approximately one week. We try different recipes all the time to incorporate in to Ms. Maru’s food. I am not going to lie, but I wasn’t sure she would eat kale, as much as I wanted to think she would. The first day I scooped a cup full out and put it over her dry food. The first day the kale took a few extra minutes to chew and landed outside of her bowl, but it was all gone. Day two, everything was eaten in a matter of minutes, this is better than I expected. I did add chicken to the recipe as optional, and thought she might be more inclined to eat it this way. I am ecstatic that she is loving her Super Foods!